If your favorite coffee brewing method is French Press, do you feel like you’re missing something when you travel? Hotels and vacation rentals only provide drip coffee at breakfast or worse, packets of instant coffee, so chances are you’re making do. Well, there’s no need to settle if you can make your own brew wherever you are. Just pack the best travel French Press coffee maker you can get your hands on and you’re all set! So, what is the difference between a regular French Press and a travel coffee French Press? The former holds the hot brew in a decanter or mug until it’s poured into your cup or travel coffee mug. This means you have to make it before hand and immediately transfer it to an insulated mug if you want to have your brew on the go. The latter is a French Press that brews directly into either an attached coffee mug or into its own coffee mug. The mug is insulated and spill-proof once closed. This means you can brew your drink whenever you want it instead of doing it before hand and that fresh taste is what is unmatched. Add to that, a French Press to go is compact and easy to pack in your luggage. If you think a travel French Press will work for you, let’s look at a few of the top rated ones available in the market, or you can find a large range of them on Amazon. Even when you’re traveling you should ensure that you use the right technique to get a good brew. Make sure the grounds are uniformly coarse so as not to get your drink muddy and use the right water temperature to get the perfect flavor and body. With the right home grinder, you can grind up your own blend of beans if you want freshness. That doesn’t mean you have to pack a kettle with an inbuilt thermostat; it just means that you should bring the water to a boil and then let it sit for about 30 seconds before pouring it onto the grounds. This ensures that the water will be around 200°F, which is ideal for the French Press method. Let the grounds steep for 3-4 minutes before pressing the plunger down. Then, instead of pouring out the filtered brew, you can just drink straight from it or screw the lid of the mug shut and take it with you to drink from later. The Aerobie AeroPress is a variation on the classic French press process. Technically, it isn’t a portable way to make coffee, but if you supply your own travel mug that fits the AeroPress base, you’ll be able to make your coffee and take it with you. Most diameters will fit except a large-mouthed mug. This unit works on the premise of air pressure that pushes hot water through the grounds. Although easy to do, it is a bit labor intensive because you’ll have to be a part of the brewing process from start to finish. However, it is faster than the traditional French Press method. Another plus point is that you can either make an American style coffee or just a shot of espresso to drink as is or use for later as a cold press. You can even use the shot to make a latte or cappuccino if you have some milk and a steam wand with you as well. This method allows you to keep your coffee concentrate for longer without it deteriorating in flavor. Just fill the chamber with coffee grounds, place it over a sturdy mug that will accommodate the base, fill with water, stir the mix with the included paddle, and let it brew for about 1 minute. Then slowly insert the airtight plunger and push it down one-quarter of an inch, and hold it there. The slight pressure will force the water through the grounds and you’ll be able to brew an espresso shot or a full cup of coffee by doing this. It comes with a bevy of accessories like a year’s supply of micro filters, a funnel to easily add grounds, a scoop and the aforementioned stirring paddle with an included tote bag to carry it all in. Granted, this coffee maker may not be right for everyone, but if you are willing to try the Aerobie AeroPress, you’ll make one fine cup of joe, as there is absolutely no sediment left behind. There are several different types of travel mugs available but the Bodum Stainless Steel French Press Travel Mug lets you literally brew your coffee or even loose leaf tea on the go. It works like all regular French press coffee makers except that the coffee is brewed in a travel mug instead of a decanter. Simply fill with coarse grounds, add hot water and let it steep for about 5 minutes. Push the grounds to the bottom and drink immediately or keep it for later by closing it with the spill-proof lid. You can do this virtually anywhere, and have great tasting French press coffee whenever you want it. The double walled insulated stainless steel mug never gets hot on the outside, and the rubber grip comes in a variety of different colors. Once the lid is firmly on and the pressing is complete, you can add cream and sugar through the drink spout or you can pour the coffee into a separate travel mug, whichever is more convenient. Regardless of what you do, this is one of the easiest portable French press travel mugs that you’ll find. If you’re looking for a press that’s designed to give you more than just one cup of coffee, look no further than the Planetary Design Double Shot French Press. It is probably the best french press travel mug you can get because it is truly spill-proof. It can be used to make coffee on the go or used like a regular travel mug if you want to make it just before you leave home or your hotel room. In addition to the press lid, you also get a normal lid for this purpose. Even though some customers would prefer that the coffee would stay hot for more than 2-3 hours, that’s really enough time for most drinkers. It works on a double filtration system, as the mesh filter ensures no grinds get through. In fact, you can use a medium grind of coffee like you would in a drip machine. If you like to use sweeteners and/or milk, you have to add them in before pouring in the hot water. The bottom of the mug has a base compartment screwed on to hold enough coffee grinds for an extra shot and it can act as an extra coffee cup or a sugar holder too. That’s why, heavy coffee drinkers or a couple can enjoy a drink one after the other. The mug itself is designed to fit into car cup holders and its handle is easily clipped onto a backpack strap via the attached carabiner clip. This Planetary Design Press has won over critics, so you can be sure that you’ll find it impressive too. Espro Stainless Steel Travel Press with Coffee Filter, 12 oz. If you want the cleanest tasting French press coffee, then you can get it with this unit. The Espro Stainless Steel Travel Press is so advanced because it has two different filters, one of which can hold a paper filter for an even cleaner brew. Because of this, it allows you to use finely ground coffee. The result is that you can actually use less coffee grounds if they are fine, and get the same great tasting coffee that you love without any grit or grinds floating around inside. The design also completely removes contact of the coffee grounds with the water once the plunger presses down, so extraction is fully halted and there’s no chance of any bitterness due to over extraction. The Espro works exactly like a regular French press. Add grounds, add hot water, let it brew for about 4 minutes, and slowly push the plunger down. The difference is in the filtration system, so you can get the full body and flavor of French Press but also get the clean taste of drip coffee. The lid seals are leak proof and the double wall vacuum sealed maker will keep your coffee hot for hours. Like with the Planetary Design Press, add your milk and sugar before you pour the water. For a unique design, for efficiency and with seals that are totally leak proof, nothing does it better than the Espro Travel Press. The MIRA French Press Travel Mug is the least expensive unit here, but that doesn’t mean it won’t make a killer French press brew. It’s all double insulated stainless, so you won’t burn yourself no matter how hot the water is inside. It’s easy to open the drink spout, just pull up the tab and you can pour in sugar and/or cream. The cover actually unscrews which makes a completely solid seal that won’t leak even if it is shaken up. Although the plunging mechanism works well, the shaft does not allow the filter to lower all the way to the bottom. That may not even matter if you use a regular strength brew, but if you like a less robust French press coffee, the grounds may not pin to the bottom and will shake around a bit during travel. The filter still will keep the grounds separate so that the coffee won’t be compromised. 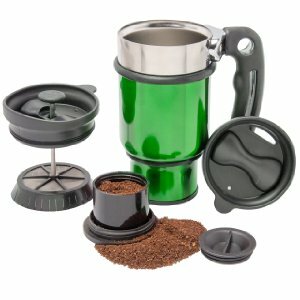 If you are new to French press, or want to see if a French press coffee mug for travel works for you, this is a solid choice. If you prefer drip coffee instead of French Press when you’re traveling, check out our picks for manual drip coffee makers that can be packed for use in a hotel or while camping.